Like many others, I got my first hermits when I was a kid on a beach trip. They actually came with a pretty good caresheet for the 90s... But we were poor and did not provide for them as we should have, and they lived in a gravelly critter keeper on only a prayer. Regardless we had a couple successful surface molts while others didn't make it. Eventually my little sister lost the remaining two while playing which was sad and I did not have the means to start again, though I have always loved crabs! 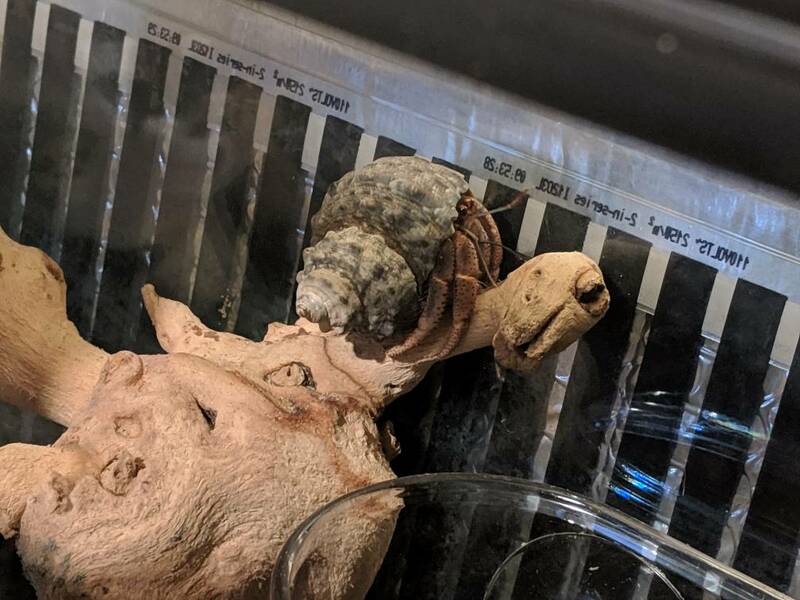 2 decades later my sister wins a large beautiful hermit crab at a white elephant exchange and I helped her set up a 10 gal using all the wonderful resources here and elsewhere online. 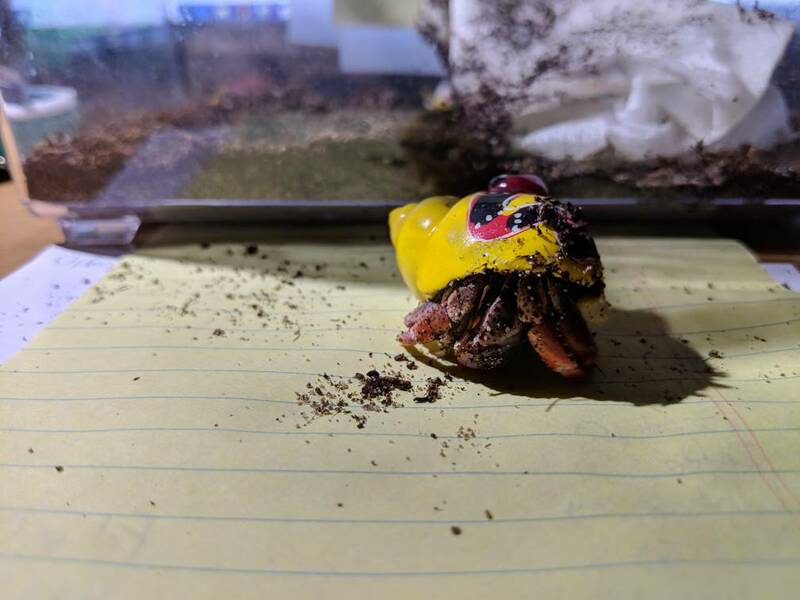 My family was dubious when the crab disappeared underground but I told them it was a good thing and lo and behold the crab, named Harry, survived his first molt! Of course, my sister has a busy life so Harry ended up in my hands before long. It's been about 2 years. I got an old sump tank (55 gal) and with lots of elbow grease turned it into a respectable 'tat this last fall. Harry needed friends, so I got two large mediums from a good LPS, and rescued two smaller mediums from Petco. This weekend I rescued two smalls from a beach shop and I think I'm at my limit now. On to the part everyone is waiting for, the pictures! If you've read my whole story, thank you and I'm happy to be here! I love sparky's shell! How old do you think sparky is? 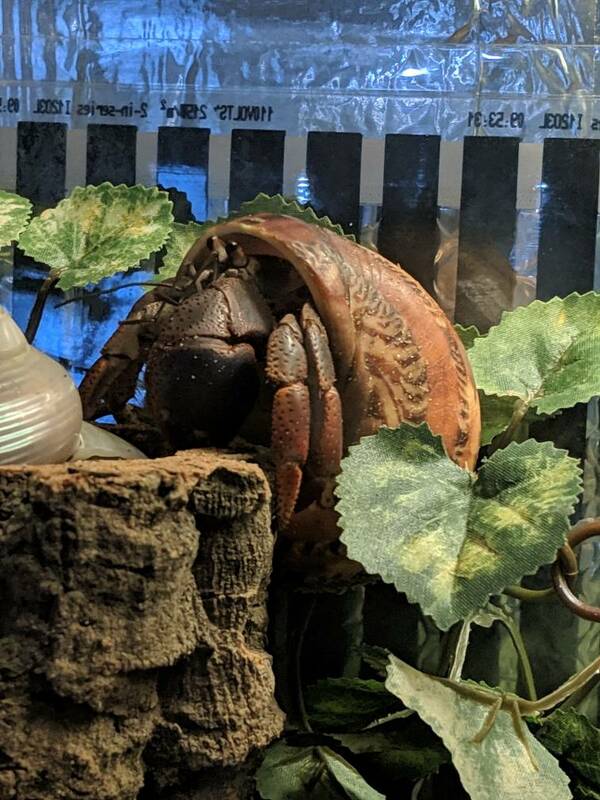 however old he (or she) is, my crabs must be about that age. Sparky(at the bottom) is my next-to-littlest, classified "Small" They have got to be at least a few years old. They actually changed into a natural green shell and burrowed right away, a day after the photo. Meanwhile Harry, who is a Large, must be somewhere in his teens. 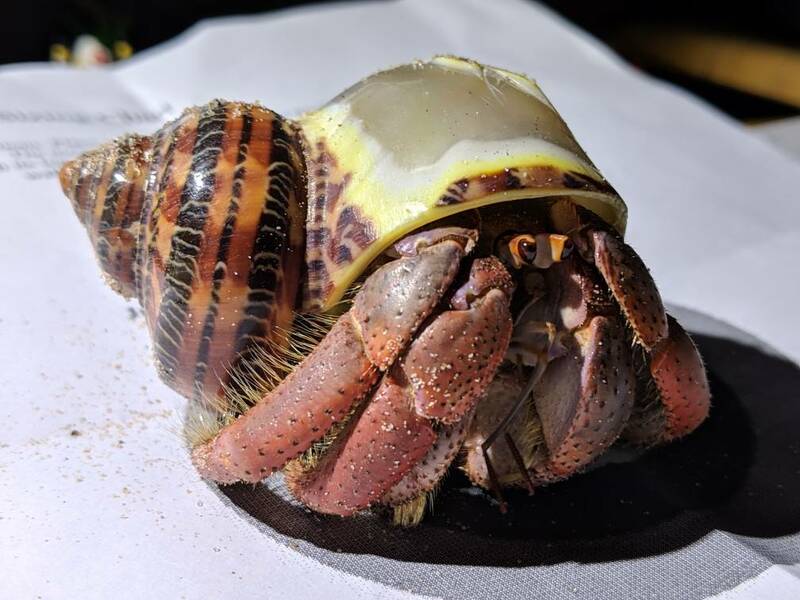 It makes me sad that hermit crabs are seen as throwaway pets by the general populace when oftentimes they are older than the children they are being bought for! 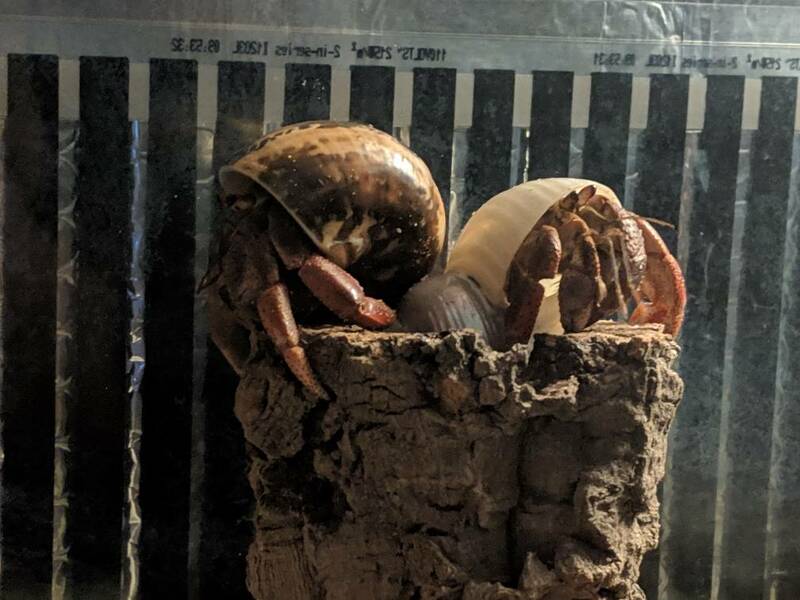 Especially after seeing the breeding attempts that some keepers have made and knowing the odds these little crabs have to beat to even get to "small" size! Yeah it always saddens me to. They are such unique creatures, and deserve care and respect just like any other creature out there. Welcome to the board and back to the addiction! The crabs look well, and sounds like you have everything you need. Awesome! 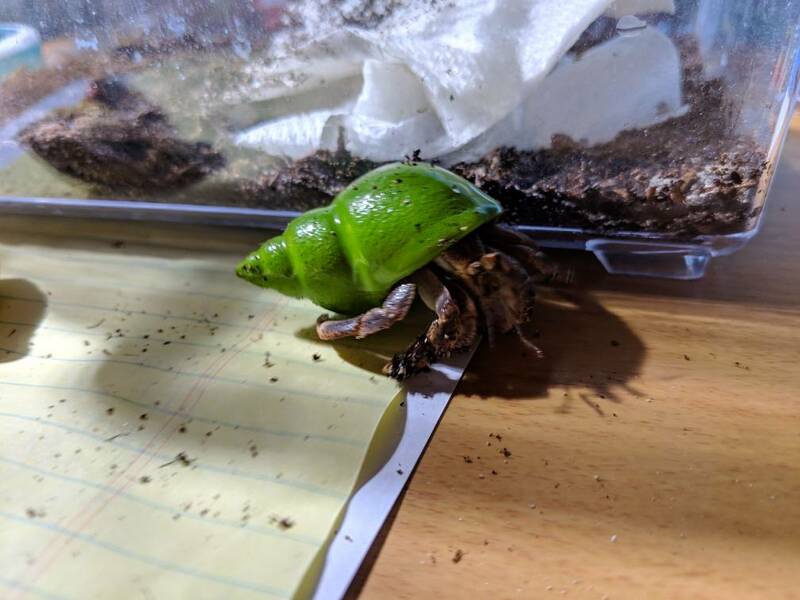 I am very glad to see how far you’ve gotten, very cute crabbies!